If you’re going to work on your feet, stand tall. The Work Western’s Gel ICE™ outsole holds up to wear. Built-in shock absorption stops jolts from echoing up to your back. Leather lining helps the upper retain its shape. Medallion stitching on the shaft and vamp make for understated style. Love this product, second pair to purchase. Shoeline has great customer service and product shipped and arrived within 2 days. I will definitely purchase this item again as well as shop with shoeline.com. I bought these boots for my boyfriend and he loved them! Very nice boots for a great price. Super fast shipping also. Great boots, this is the second pair of Double H boots I have purchased. Of all brands I have owned over the years they seem to be of the highest quality. Nice boot. A little tight but may just need to break in. Love the boots, took over a week to get them broke in. I can honestly say, these are probably the most comfortable pair of boots I have ever owned. I work long hours every day, walking on concrete floors, and have yet to have any problems. I have tried numerous other brands and they did not have near the comfort that these boots have. I'm on my feet for some day up to 14 hours a day working at a grain plant dumping trucks and my feet never hurt. The most comfortable pair of boots I've ever had. I wear them every day well worth the money. Nice boot. I have not worn booths for years and this made it quite easy! Doubl H makes awesome boots! American made. Great price. This is my second pair of the work style. I also have similar style for everyday. The boot is a quality boot. But the consistency of fit is not the best. I have purchased at least 7 pairs of these boots but have to send them back at least every other purchase due to sizing differences. Sometimes the shaft of the boot isn't the same on both sides and sometimes the width is different. Never know what you are getting when you open the box. Double H boots fit me well and shoeline. Com has been my vendor for several years. The customer service is wonderful and my boots have always fit. I bought a pair of these is Fairbanks five years ago and wore them everyday driving the Dalton. I have worn them for two years now in the oil patch of North Dakota and they have held up remarkably well. I am about to buy my second pair and would recommend them to anyone wanting a solid durable boot to work in. I always buy my work boots 1/2 size too large and put in another liner insert for extra padding and comfort as I have unusually flat feet. They fit perfectly even though I also have a narrow foot. The last pair of HH boots I had which these replaced I wore 7 days a week for 10 years outside in inclement to extremely dusty conditions. I’’m a farmer. I buy a new pair of these each year and I won’’t stop until they’’re discontinued. Great work boot. perfect right out of the box to wear all day. very well built boot. looks great and is very comfortable. 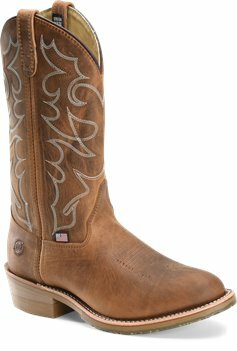 it’’s good to have a usa made boot of this quality at a very good price as well as the materials and workmanship. First purchased 10EE felt tight- returned for 10 1/2 EE PERFECT..love these boots and customer care..awesome with rapid delivery very happy with everything. 3rd pair of these boots that I have purchased over the last 6 years to wear to work. Great boot. Today was the first full day of wearing this boot. I normally take about a week to get used to a new pair before I wear them for 10 hours straight at work. Feet feel good tonight after a full day on my feet. second pair from these folksbeen happy ever since the first pair.Great fit and great help from the people when I called in. I will keep buying this boot until they don’’t make it anymore. 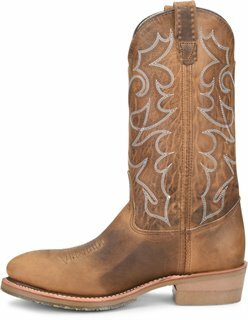 Nice looking steel toe western style boots comfortable well made. Cheapest price with free shipping I found anywhere in a store or online. Boots are a little snug when you first put them on but the leather will stretch quite a bit. After they are broke in the fit great. I could have bought less expensive boots. These were well worth the extra money. A bit heavy but ozzing with quality and craftsmanship. The quality and detail will stand these boots apart at the jobsite. I didn’’t like the idea of ordering boots on line I like to try them on first. But I saved $50 over buying them at our local store and they fit true. The fact they sent a return label with the boots in case you need it shows they have a lot of confidence in their product. My favorite pair of cowboy boots for comfort. I only wish Double H could put thicker outsoles on these fancier styles like their wellingtons. Shoeline is a pleasure to deal with and will buy my next pair through them. recommended site to family members and they ordered boots recently too Does take 10 days to receive item. Great product. At first I ordered a 10 1/2 which is what I usually were in other boots and EE with but they ended up being to big so I exchanged them for regular with and size 10. Those fit great. They first were king of snug the first day but shaped up quick. This is my first pair of double h boots and I am really happy with them. They are now at work and out trail riding. Love the boots. This isn’’t the first time I’’ve worn this brand or style of boot. But it is the first time I’’ve ordered online. I had no problems-they fit like a glove. I had originally bought these boots for myself after recieving them I had found that they were a bit big on me so I had my son try them on and they fit him pretty good. The only thing we could find wrong with them is that the right boot was a little wider than the left boot. Great pair of boots. Need no break in period the gel section under the ball of foot is wonderful. I spend 16 plus hours in boots every day. These are good looking and wear great. Everything was perfect with the boots. Delivery was right on time per the order date.